Home » Interesting Discussions » Your Say: Where do you like to shop for your beauty products? Your Say: Where do you like to shop for your beauty products? I was talking to someone last week, when I was told that a couple of luxury beauty brands will be setting up freestanding shops soon. Now, most of us would have been used to seeing freestanding luxury shops for leather goods or clothes or accessories, but not many for beauty right? In recent years, I did notice some beauty brands breaking away from being housed in multi-brand department store beauty halls. Clinique is a noticeable breakaway with some standalone counters, and Shu Uemura has long had its own shop for a while as does Kiehl’s and Bobbi Brown. From the luxury brands, I have noticed that Chanel has its own beauty store in 2 major malls locally, and soon, Dior will join in with their own standalone Dior Beauty store. Where do you like to shop for your beauty products? Do you prefer to shop in a department store beauty hall, with the different brand counters surrounding you for variety and choice? Do you prefer somewhere like Sephora or Sasa which is just dedicated to all things beauty (albeit pretty much like a department store beauty hall) with different brands in one place? 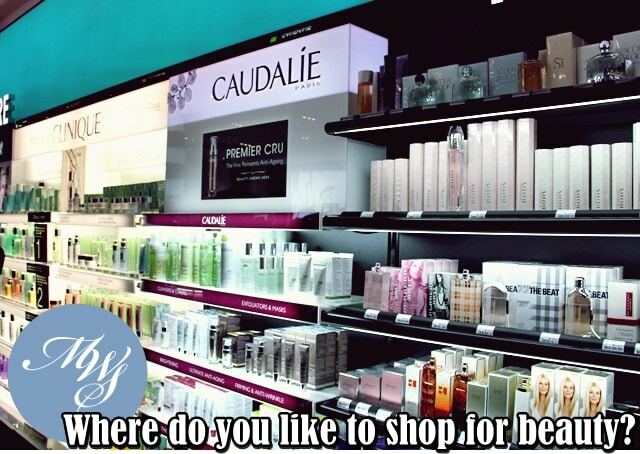 Or do you prefer going straight to a specific brand’s standalone counter or store outside of a beauty hall? For myself, I prefer shopping in a multi-brand environment. Shopping in a beauty hall allows me to browse different brands in one place, in a comfortable environment, and quite often, different levels of service from the different counters and brands mean that if I don’t get the service I expect from a brand/counter, I quite quickly move onto one that will serve me. I’ve discovered new brands and products this way. Also, it’s easier for me to just swatch and run, because I can always say that I’m browsing and move off to a different counter. Multi-brand beauty stores like Sephora or Sasa are fine but I find the former a little boring and the music too loud and the whole place just has a pop feel that I can’t relate to (I know, weird). The latter has a service problem so I only go in there for brands that I know I can’t get anywhere else, or unless they are on sale. I do like niche stores like Ken’s Apothecary but if I can find their brands in a department store, I buy in the department store. Points take precedence! As for single brand standalone stores, I don’t patronize them as much simply because most times, the brands already have a counter in a department store. So, if I were to buy something, I’d buy it in the department store so I can collect loyalty points or GWP promotions. The few times I do, it’s because the brand isn’t available anywhere else, e.g. NARS. So, when I was told that most brands are setting up standalone shops because consumers now prefer to shop at a boutique as opposed to a department store/multi-brand store, I did wonder if it was the case. So, it’s now over to you to help answer my question! Do you prefer to shop for beauty products in a standalone brand boutique? Or do you prefer a multi-brand beauty hall or store? I noticed that I’ve been frequenting Sephora since it’s the most convenient (it’s just opposite my housing area!). in February alone I enjoyed 10% discounts 3 times in 4 weeks because they were having some CNY surprise sale, then it was my points accumulation and then it was the lucky draw I got from the CNY shopping. best deal ever received from beauty haul shopping in our country. because of this I no longer shop at places like Isetan or aeon because I don’t get that much deal from them as and I don’t need to drive far + parking hassle. You lucky girl to have Sephora in your backyard! I guess the reason I don’t go to Sephora so often is simply because of accessibility issues. I don’t head down to areas where they have stores very often and as a result, haven’t enjoyed the sales I’ve been hearing about! I do have to agree with you about the freedom in Sephora though. Most of the time you’re left alone to browse and I think that’s the best thing about the store! Depends on my intention of the day. If i just want to browse and probably buy products from various brands AND limited time, I would go to department stores or pharmacies – favourite places are Parkson, Guardian and Watson as those are fun to go at my area, no iSetan, Metrojaya, Sogo, etc etc. But most of time, I much prefer standalone stores or wishing my favourite products have their own stores at my place. I’m a loyal customer to very few brands and the sales rep usually know me well so I can just hang around to get tips and advices (and somehow I will end up b and also, no distraction for my dearest wallet to try other brands as I tend to get disappointed at brands that I first time tried. Besides, from my experience, stanalone stores have more varieties and more products in stock compare to department stores. Paris B – Products surfer and adventurer – I like the sound of that! 😀 Describes me to a T LOL I think I’ve just mastered the art of fobbing off advances by pushy SAs. That I do tend to know a little more or ask a little more questions might intimidate them as much as they do me too! haha but good on ya for finding good SA to work with – A good SA can make all the difference between you flouncing out the door or lightening your wallet! Deparmental store is the way to go! Like u, I prefer collecting points! I enjoy the fact that the points can be used to buy other things, yay!!!! I prefer multi-brand environment. This is especially useful if I’m looking for specific product (e.g. foundation) and not knowing which brand to choose. Also, the competition there is high so SA’s had better perform. :p And you can always tell them “I’m just browsing”. Also, if they can keep you at their counter, even if it’s just “browsing”, it means quite possible sales at the end. I guess the brand specific shop is good if you already love the brand. But then, you can always get the same stuff from department store? Unless, they offer unique services at the shop. Hey was I dreaming or has Sephora opened a store in Bangkok? I thought I read about it somewhere. And you’re right about the browsing bit. Sometimes, I just like pitting different brands against each other and it helps to be able to do that in a multi-brand environment. Sometimes I go to standalone stores because they may have exclusive collections or a better range of colours/products but I’ve also learned I’m not as brand loyal as I should be so it’s multi-brand all the way! Yes it was opened since last year, in Siam Discovery (opposite Siam Paragon). Well, it’s difficult to be brand loyal, to be honest, given the massive choices we have!! Ah yes you’re right about standalone store having exclusive stuff. 🙂 Sometimes you can use department membership card with standalone stores. Over here, I get 5% discount from expat membership (the locals don’t have this rate.. teeheeee). It really depends. Sometimes, service trumps points. I remember (years ago now) the Chanel in Myer refused to sell me the lighter shade of foundation because clearly I’m asian and I MUST use a few shades darker. I was pissed off and have not bought from Chanel in Myer ever since. I’d stalk the standalone boutiques or get them online. Thankfully, most of the sales staff here are very understanding when you say you’re just happy browsing. For those who won’t leave me alone, I’d make it very clear I was annoyed and hop off. With Australian retailers crying foul because we shop online (and overseas) and they’re not making any money from us, it’s about time they learn a little bit about service. And know their products! MAC in Myer once told me their Jeans collection (I think) was not released yet even though it was clearly on display. I pointed it out and asked,”WHAT’S THAT THEN? !” and walked out. And hence, I’ve not bought MAC in years. I’m not trying to make life difficult for the retailers. But my cash is mine to spend where I wish and retailers need to work a little bit harder than sticking a hand out and expecting me to buy from them just because you know, ‘Straya. That’s dumb. Agree about service in Aus. We’re expected to pay a premium here but get worse service? What am I paying for? I know, right? I went to the Clarins counter in Myer and I was intending to buy a moisturiser which was part of a Christmas gift set, but the SA there just ignored me and I had to wait for 15 minutes. There weren’t any other customers and she was looking at me while I was browsing so she clearly saw me yet she didn’t even greet me; not even a “I’ll be right there, won’t be too long”. Too bad that only Myer had the Christmas coffret that I was looking for or I would have left and gone to David Jones instead. Eh, you brought up a good point re: service actually. I’ve blacklisted a specific counter in Isetan simply because I can’t stand the shoddy service I get there and I’d rather go somewhere else where I don’t get points. That said, I had fairly decent service at a MAC counter inside a department store. Not too snooty and was helpful, which is a great contrast to any one of their standalone stores. I remember from my last visit, being very shocked at the prices of cosmetics in Australia (and other things too) and really, at those prices and with global internet shopping being now the norm rather than the exception, it doesn’t make sense to get into a hissy fit – just perform better so people will shop in store. That said, considering many items are marked up almost double, I don’t think service is the key factor anymore. Oh I SO get you on the “feeling intimidated” thing. It’s probably the main reason that I shun standalone stores – beauty products or otherwise. I think those in marketing should really take note of the fact that trailing potential customers simply do not work and effectively drive many of us away. These days I mainly shop online. Shopping online gives me so much more freedom in terms of browsing and comparing prices including online stores that are overseas. Apart from that, I have the option of brands that are not on our shores, special online discounts (I have not paid full price for products in a long while) and free samples (samples should, by definition, be given free since it’s to enable customers to test out a product before buying it and not be included as a PWP which often dictates you buy that very product you get samples for). If I had to choose between standalone boutiques and beauty halls, I choose beauty halls because I’m usually there to browse and test out products before I buy them online 😀 I should point out that very often, the sales assistants’ knowledge of the products leave much to be desired and I often end up explaining to them more than vice versa. That said, I’ve encountered SAs in standalone boutiques who really know their stuff and who don’t suffocate me when I browse. When I encounter such SAs, I tend to stick to them like glue and choose to buy from whichever boutique / counter they are stationed at. And to drive home the point about being able to browse and compare prices at leisure online, I just stocked up on a 250ml bottle of Bioderma Sensibio H2O and got another 250ml bottle free off Escentual. Even after adding on the shipping charges, it works out about RM30 cheaper than getting the 500ml off Strawberrynet. Ooho! That is such an awesome deal Isabel, thank you for sharing! Back in PG, I like to shop at Parkson exclusively. That’s because of their loyalty program and their constant voucher promotions. Now that I’m in the States, I actually prefer to shop at Sephora (in-store and online) or anywhere online. For me, I love Sephora because their SA never hassle me if I said I don’t need help and of their loyalty program. And shopping online is just more convenient, and I can avoid being pushed around by SA at the department store. IKR! Well I couldn’t go in for very long if I am with my mum 😀 hehe. I like to shop in department stores and Sephora when I’m overseas. However when I am in Australia it’s a different story. I would love to shop in departments stores here and sometimes I browse but service is just awful here, if you can even get service. I’ve been at counters where the salesperson would rather chat to colleagues than serve, or where they’ve looked at me then walked away. I’ve found a significant difference depending on how i dress. If I’m casual then I might as well be invisible in David jones. Bring the LV bag and there’s no trouble. It’s disappointing. So beauty halls and multi brand stores, but only when I’m overseas! I’m an avid online shopaholic (yes beauty products)!! Because I really doesn’t like being ‘intimidated’ by the SA. So if I need some swatches on hand, I usually go Sephora. Once in a while, I do love walking around Watsons and swatch things I like too. Watson’s is a fun browse I agree although some of the promoters bug me. Then again, I suppose it’s their job 🙂 Online shopping is still the best! OMG!! I’m not alone! I feel intimidated too walking into standalone shops. But then again, it all depends. I’ll go into standalone shops if I want to know something more about the product. I feel that the SA at standalone shop knows better compared to multi-brand store. Departmental store somewhat intimidates me as well because I feel that it’s kinda too quiet and there’s only one SA there so she’ll be looking at you if you were to try on any products. I think I still prefer multi-brand store. At least I don’t feel like people is “watching over me”. Hahaha but I must say, I think SASA is pretty cluttered. I never like shopping there. But, Sephora is good. Just wish they have online site though. I like Sephora and Tangs. I am not so fond of Isetan because the brands are incomplete. At Tangs, I can find NARS and Guerlain. Mostly these days, i shop at DFS, departmental beauty halls and online. I don’t quite ‘trust’ SASA etc. as i feel that the products might have a compromised shelf life compared to those sold at the brand’s counters (e.g. Estee Lauder). Maybe it’s just me. I feel more comfortable in Sephora cos I could be left alone browsing and doing swatch and pick and pay straight without needing to communicate with any BAs. Can do a fast & furious shopping there. Not much of rebate or vouchers we can get from here but then occasionally their adhoc the 10-15% discount is good. Haha I never shopped enough at Parkson to quality as an Elite member! 😛 But I know they do very good promos. By contrast, I love the new Isetan Beauty Hall. It now looks so much like the ones overseas – bright and so many more brands! Sephora is great for browsing but I find it a horrible place to go if you need any help from the SAs. A lot of the time the SA there don’t know anything so it’s hard especially when I was trying to colour match my foundation for Urban Decay, that isn’t sold anywhere else! Oh my seriously? Prices went up? Sigh… everything’s going up isn’t it? But yay for good service and lots of samples 😀 That’s what service should be like everywhere! Yay, high five! Like you, “I’d pick a department store beauty hall first, then a multi-brand store and finally the standalone beauty boutique” this describes me too well 🙂 I think the best perks and services come from beauty hall (though I have met intimidating and scary ones too!). Other than the GWP and vouchers, there is loyalty points collection. I find that when sale and the beauty lucky stars coincide, Parkson offers one of the best perks around during sale and Bonuslink Member’s Day. I.e. you get extra vouchers and extra Bonuslink points during their Bonuslink Member’s day which usually occurs on the last Friday of the month. The vouchers come in 2 sets – one which you can use for subsequent beauty purchases or other department store items and the other set which you cannot use for cosmetics. Standalone boutiques can cause brand mania and paranoia in me…So far I have not stepped into any of these, Bobbi Brown, Chanel, Shu Uemura, MAC. The vibe they emit can be standoffish at times. As for online shopping, yes, I do frequent a few sites and so far, I thank my lucky stars that I have enjoyed superb shopping experience. Clinique is really doing very well with their online shopping with lotsa promotions and freebies up for grabs. Kudos! Points and there and then Rebate vouchers. These 2 are the driving force for my vote on department store beauty halls – notwithstanding the occasional pushy-ness of some SAs. As you said, can try something and dash off saying need to think about it. Main thing is that I get a feel (or rather an illusion of a feel) that I’ve managed to maximize the $$ spent with the little bits of kickback in the form of points and rebate vouchers which later unfortunately but invariably translates into spending more $ when topping up to pay for an item purchased with (insufficient) vouchers. I don’t have any specific store to look for either skincare or cosmetics products. Probably mostly going for those with membership stores, i.e. Isetan and Sephora, etc.